When you are driving and you approach a yellow light, you know that means caution. The Yellow Dog Project uses a yellow ribbon on the leashes of dogs that need space to signify the same thing. The Yellow Dog Project was created to bring awareness to the public about those dogs that need some space from people and other dogs while they are in training, recovering from injury, and being rehabilitated. Other reasons may include other types of health issues or being frightened or aggressive around other dogs. There are many reasons why it may not be a good idea to approach a dog, but before the Yellow Dog Project, there was no way to know without being told, which can sometimes be awkward for people. Plus, other dogs simply like to be left alone, a fact that can be difficult to explain in a social environment like a dog park, but now owners can attach a yellow ribbon to let others know to give their dog some space. Best of all it is communication that is unspoken, so rather than having to go through a long explanation about why your dog does not like be approached by other dogs or people, the yellow ribbon will let people know for you in a courteous and respectful manner. Children in particular are apt to approach dogs, so teaching large numbers of them the meaning of the yellow ribbon would prevent a significant number of dog bites. The international movement started last year by a dog trainer in Alberta, Canada and has spread to 47 countries in a matter of months as dog owners around the world as dog owners embrace this worthy cause. Of course, even though the movement is spreading around the world, it is still in its infancy and needs to be shared in order to be widely understood and adopted as standard dog etiquette. 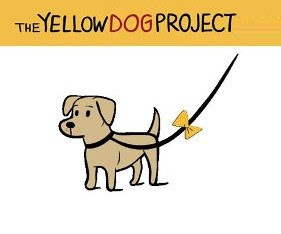 The Yellow Dog Project’s Facebook page has over 14,000 fans so far and many of the posts discuss plans to spread the word in different communities. The rise of social media over the last decade allows movements like the Yellow Dog Project to spread quickly. However, this worth cause has yet to go viral in the way that it potentially could. The creation of partnerships with major corporations like Purina or PetSmart could really give the campaign some major exposure, while working to spread the work to veterinary clinics in participating countries could go a long way toward creating a widespread grassroots movement. Being a veterinarian and invisible dog fence specialist is her career, freelance writing is her hobby. Advice and information by Susan Wright, can be found covering many topics including dog based, scientific research. Do Yorkshire Terriers Make Good Pets?